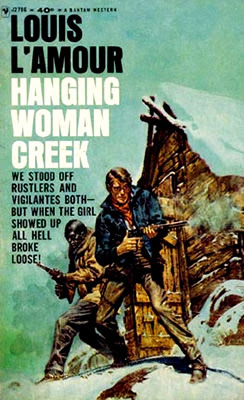 ‘Hanging Woman Creek’ was released in 1964 by Bantam Books. For me, it’s considered one of L’Amour’s early books due to being released about 15 years into his writing career. At 150 pages, it fits snugly into the author’s “short but exceptional” western template. Set in frosty Montana, L’Amour introduces us to the rough and tough Pronto Pike. He’s a down on his luck journeyman who drifts from job to job all over the country. Like many paperback cowboys, Pronto is decent with his fists and Hell with a rifle. He’s a great cattle guy, a hard worker…but his temper has been the bane of his existence. So, it’s fitting that the book opens with Pronto being released from an overnight stay in jail along with a couple of other drifter types – Van Bokkelen (who may be wanted for murder) and an older African American boxer named Eddie Holt. After separating themselves from Bokkelen, both Eddie and Pronto team up to find work before the bulk of winter hits the Montana timbers. After asking around, the duo find a great stint punching cattle for a rancher named Bill Justin. It’s a good gig – warm cabin, plenty of wood, a few books and the calm day to day activities of babysitting cattle through the winter. Eddie, while not a skilled rancher, earns his keep by preparing good meals and teaching Pronto some boxing lessons. In turn, Pronto shows Eddie how to punch cattle. However, the good vibe at Hanging Woman Creek doesn’t last long. L’Amour slowly envelopes the story with an impending sense of gloom, enhanced by the cold, rural landscape. After learning that cattle rustlers are among them, Pronto finds a murdered man in the snow (with a bit of mysterious horseprints). With tensions high and both men feeling watched and unsettled, Pronto rides into town to present the dead man and to make a sworn statement. There, he finds an Irish beauty named Ann Farley, the sister of a nester named Philo Farley, an old friend of Pronto’s. Ann explains that her brother could be in trouble and needs a ride out to his cabin just shy of Hanging Woman Creek. I am recommending this one to any action and western fans, and with that being said, I don’t want to elaborate too much further for fear of spoilers. The heart of the book is ultimately a classic western…but it’s loaded with atmosphere and mystery. Where’s the rustlers, who’s leading them and what’s behind the murders? How is Philo and Ann Farley tied to it? While the first third of the book develops great characters, the middle really expands on that and introduces mystery and intrigue. The last third is Hell bent for leather, matching the book’s cover perfectly. L’Amour is a master storyteller and this one has all of his best ingredients. Action, mystery, interesting (and lovable) characters and a frantic sense of pacing. It’s a short read packed with atmosphere and firepower. ‘Hanging Woman Creek’ is highly recommended…and won’t let you down until that noose snaps tight.